Emmetropia: The eye is in a state in which it can focus light directly on the retina when viewing objects at a distance. Ametropia, or Refractive Error: The eye is in a state in which it cannot focus light directly on the retina when viewing objects at a distance. 1. 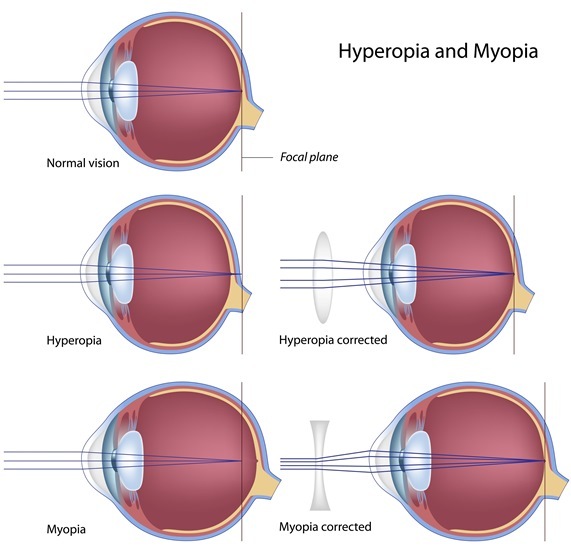 Myopia, or nearsightedness, is a condition of the eye where the light that comes in focuses in front of the retina. This can be caused by a cornea which is too steep, or an eyeball that is too long. 2. Hyperopia, or farsightedness, is a condition of the eye where the light that comes in focuses behind the retina. This can be caused by a cornea which is too flat or an eyeball that is too short. 3. 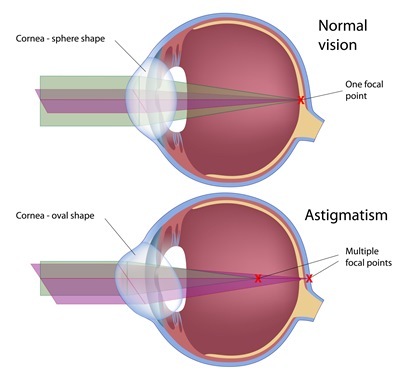 Astigmatism is a condition of the eye where the light that comes in focuses irregularly into separate points. This can be caused by a deviation in the spherical shape of the cornea. The typical cornea is normally dome-shaped like half of a basketball, or symmetrically round. An astigmatic cornea is shaped like a football cut in half lengthwise. 4. Presbyopia is a condition of the eye which typically occurs after age 40, and exhibits a reduced ability to focus on near objects. It is caused by a loss of elasticity of the lens due to aging. This results in difficulty with reading and near vision, often requiring reading glasses or bifocals. 1. Glasses: Glasses are frames bearing lenses worn in front of the eyes. They are the most common way to correct for refractive errors. Generally, a single vision lens is prescribed to provide clear vision at all distances. However, for people over age 40, a bifocal or progressive addition lens may be needed. Most glasses are not made of glass anymore but of plastic, including CR-39, Polycarbonate or Trivex. These materials reduce the danger of breakage and weigh less than glass lenses. 2. Contact lenses: Contact lenses are small, thin disks of plastic that rest on the surface of the eyes. They correct vision for myopia, hyperopia, astigmatism, and presbyopia. According to the American Optometric Association, over 30 million people wear contact lenses in the United States. Depending on your occupation, motivation and lifestyle, contact lenses may provide a safe and effective alternative to eyeglasses when used with proper care and maintenance. Refractive eye surgery is any eye surgery used to correct the refractive errors, as opposed to using glasses or contact lenses. This can include various methods of surgical remodeling of the cornea or cataract surgery. LASIK is the most common refractive surgery used to reshape the curvature of the cornea for correction of myopia, hyperopia and astigmatism. LASIK (laser-assisted in situ keratomileusis) is commonly referred to simply as laser eye surgery. This is a type of refractive eye surgery performed by an ophthalmologist using an excimer laser. This surgery reshapes the cornea to correct refractive errors.